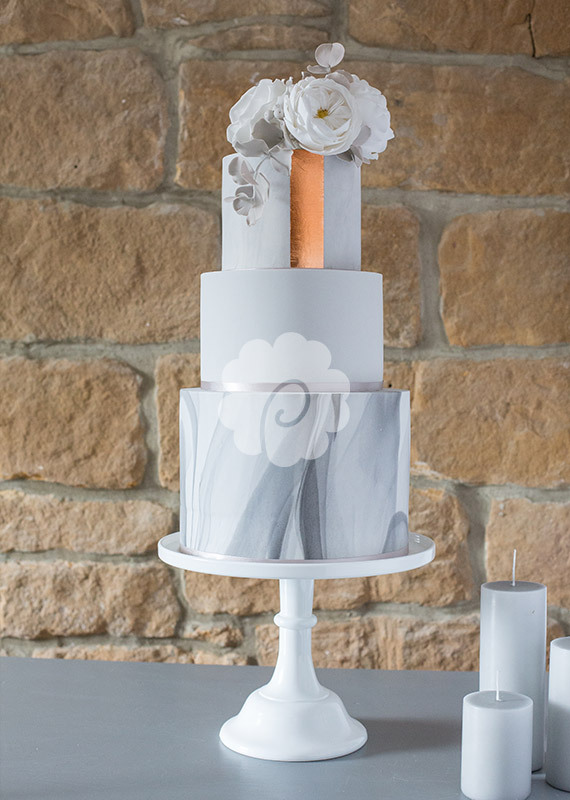 Here at Poppy Pickering we offer a bespoke design process for your wedding cake, from creating a flawless finish on chosen cake design to creating a hand drawn sketch of your wedding cake. Each wedding cake receives our full attention therefore our prices reflect the personal service and premium service we offer to every one of our couples. We do however always try to cater to different budgets therefore please do get in touch and we will be delighted to discuss options to suit your requirements. 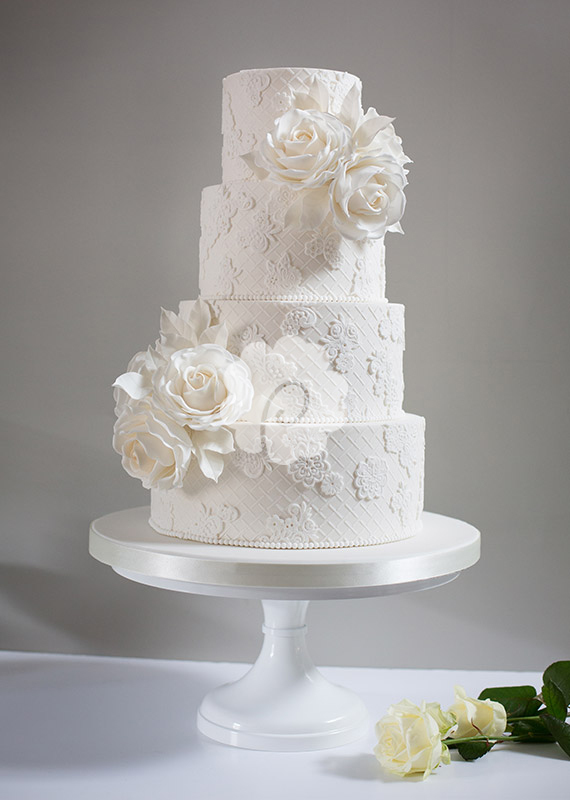 We currently have a minimum spend of £550.00 on all wedding cake orders (excluding delivery/set up charge). These prices are for a simple iced and decorated wedding cake. Further decoration such as complex sugar flowers, piping or metallic leaf are priced according to intricacy. 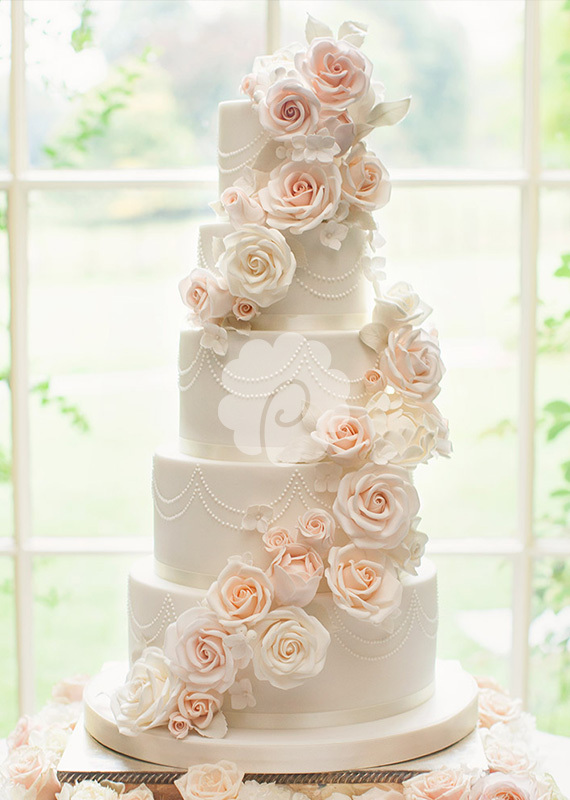 Having a combination of dummy tiers and cake tiers will reduce the total cost. The final cost of your wedding cake will depend on the number of tiers, size of tiers, cake design, whether you require fake (dummy) tiers, just sponge or fruitcake tiers and venue location. All of our cakes are a generous 5” deep, are baked using the finest of ingredients and are finished to our exacting standards. All our cakes are covered with a thin layer of white chocolate ganache before covering with fondant in order for us to achieve a sharp, clean edge. We do not make 'naked' or 'semi-naked' wedding cakes. The portion guide is based on a single cake tier of approximately 5" deep and finger portions of 1"x1"x5". Delivery and set-up is addition to the price of the cake. For our simple swirled cupcakes the starting prices are £2.95 and for the more complex and decorative cupcakes prices start from £4.50. Please note, a cupcake tiered wedding cake will usually cost more than a tiered wedding cake. This is due to the fact that each individual cupcake will require decorating and also the portion size for a cupcake is larger than individual pieces of a tiered cake. Shaped decorated novelty biscuits start from £3.55 each. We are able to produce beautiful wedding favour biscuits, from shaped novelty new baby treats to birthday themed shaped biscuits. Getting married or having an event, we can create and offer wedding favours, table chocolates or beautiful hand piped named lollipops. Take a look at some of our amazing chocolates that can be used in our collection of hand finished favour boxes. The boxes are priced at £3.55 for two chocolates and £4.25 for three chocolates. We also offer a special edition collection of wedding chocolates with delicate lace patterns and an edible metallic finish (slight premium price).